Serge Gnabry joined Arsenal as a 15-year-old in 2010, but had to wait for almost three years before he made his mark in the team. With the team suffering one of their trademark injury crises, Gnabry was plunged into the depth and he handled himself pretty well, scoring one goal in the 2-1 win against Swansea and winning that penalty against Crystal Palace. His performances that season earned him a nomination for the UEFA Golden Boy award that was eventually won by Juventus’ Paul Pogba. In the club’s bid for the youngster to get competitive football, he was loaned to West Brom and that turned sour. After a successful Olympic Games campaign that saw him score six goals for the Germans, Gnabry has been on the back pages recently, with ESPN reporting that a transfer to Werder Bremen is in the works. With Gnabry’s contract expiring this summer, Arsenal is at the same point they were with Robin van Persie where they are left with just three options – give the lad a new long term contract, let the lad run out his contract and leave on a Bosman, or everyone’s least favorite – sell him off and make some money of him. Werder Bremen has been quite confident on Twitter, expressing their optimism in signing the player. Even if he wants to leave next summer, he should sign a new contract in appreciation of what Arsenal has done for him. That way we can get a decent transfer fee for him. Gnabry has not done enough in England to hold Arsenal by the balls. I don’t like players with that kind of attitude. This is someone that couldn’t even get into West Brom’s team. If Gnabry is holding Arsenal to ransom, it makes me wonder if Arsene Wenger should continue keeping the faith in some of his players. Because he shined at the Olympic Games, does it give him any right to put us in this situation? Gnabry is a talented kid, no doubt. He has had his injuries and the club has stood solidly behind him for years. The only reason he was allowed to go to the Olympic Games when the likes of Alex Iwobi wasn’t allowed was because he needed games. If because of that Olympics, he thinks he is more than a squad player, he can move on. No hard feelings, but I don’t like these kids acting this way after all the faith Arsene Wenger has had in them. The only issue I have with Gnabry leaving the club is that we would get peanuts from the transfer. I would like Gnabry to stay, now that we sent Joel Campbell on loan to Sporting CP. I believe he can get into the team this season, especially on the left wing. If he decides to go to the Bundesliga, I don’t see him getting any better than he is already. Loan? Yes. Selling him would be quite ridiculous because in three to four years time, Arsenal would have their ‘Gnaback’ like Manchester United did with ‘Pogback’ to sign Gnabry for $100m. 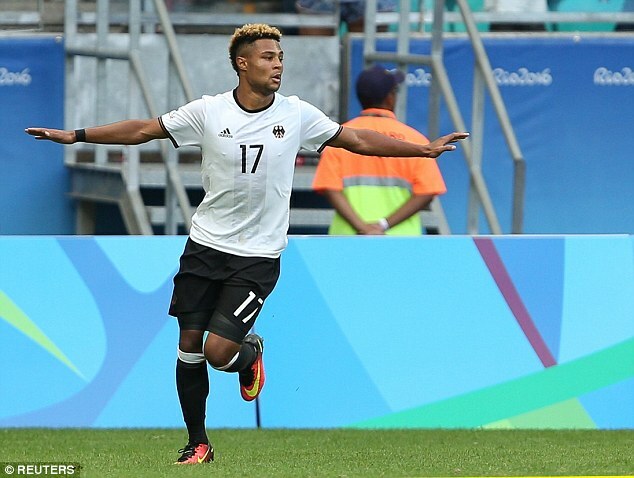 With a year left on his contract and at 23, Arsenal has to be decisive with Gnabry. If he thinks his performances in the Olympic Games are enough to push a move, then Wenger has to decide. Give him a new contract and send him out on loan, or just sell him to the highest bidder. Right now, I’m not bothered about Gnabry. Does Lord Nicklas Bendtner have a club? There you have it. Lot’s of mixed opinions about the lad’s potential exit. It Makes Sense to Send Chambers on Loan, but Wilshere? Arsenal are set to make the announcements of new signings, Skhodran Mustafi and Lucas Perez but Wenger confirmed in his last press conference that a player or two would leave on loan, rather than on permanent basis. After leaving the Gunners to join Sporting CP on loan, Joel Campbell made his debut in the 2-1 win against FC Porto. 101 Great Goals have posted some of his personal highlights of the game for those interested. With the capture of Mustafi, the journos asked the manager about the future of Calum Chambers as he was going further down the pecking order in the heart of Arsenal’s defense. 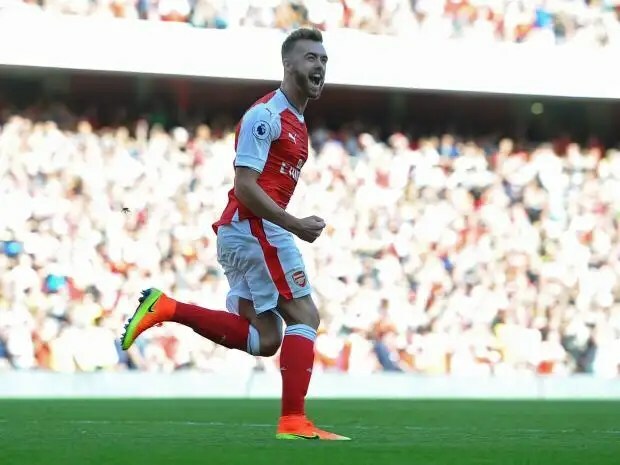 It’s bad enough that Rob Holding has axed him out of the team despite injuries to Per Mertesacker and Gabriel Paulista, but Chambers has not covered himself in glory, following that torrid start to the season against Liverpool. Yes, he might have scored a goal on the day, but his defensive performance was questionable, and fans can agree that losing his place in the team to Holding was justified. With the manager confirming that Chambers was leaving on loan, there were many clubs that were mentioned but according to the Independent, Middlesbrough emerged as the favorites and have secured the lad on loan for the entire season. Will Chambers be able to break into the Boro team? Maybe, maybe not but he’s worth monitoring and with Boro in the Premier League, Chambers development can only get better. He arrived at the club with some hype surrounding him and he did well with some early season performances but he suffered a roasting from Jefferson Montero at the Liberty Stadium and things haven’t worked out too well for him since then. A move to a club like Boro will be good for the lad. At least, he will get away from the spotlight and can concentrate on regular football, which is what he would be hoping for. I wish him the best at the Riverside and I will be monitoring his progress. So I saw some tweets on social media about the possibility of Arsenal sending Jack Wilshere on loan and I took it with a pinch of salt but when Sky Sports and other reputable columns carried the story, I had a rethink. Is Arsenal really considering sending one of its favorite, if not its favorite sons, Jack Wilshere, out on loan? First of all, why would Arsenal even consider the possibility of sending Wilshere out on loan? Is it because of Sam Allardyce’s comments on the lad that he should get regular football before he earns a place in the England squad? Is that what it’s about? Being concerned about Wilshere making the national team, rather than the team that has stuck with him through the countless injuries and what have you? 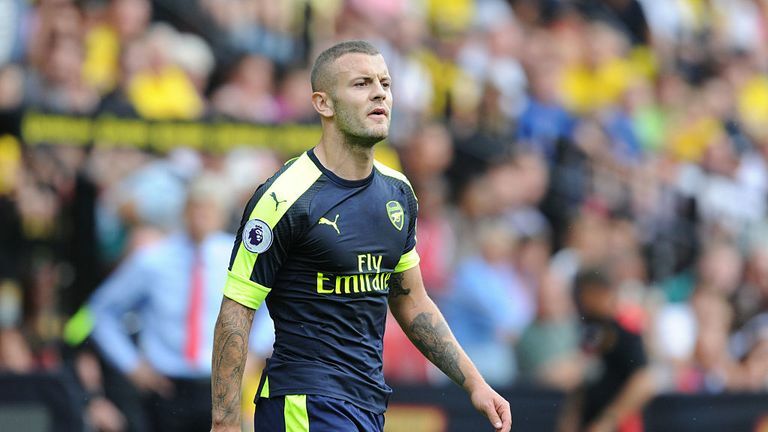 From a footballing standpoint, I think it’s a rookie move from the club because Wilshere is one of the most unique players in the squad. There is no one else that can offer us his lung-bursting runs and sleek style of play that sees him break opposition defenses with consummate ease. I know many have been concerned about his injury record and are unhappy that he can’t be relied upon to stay fit but it’s Arsenal – injuries have become a way of life here. Look at the captain, Mertesacker, that spent the entire holidays drinking beer and watching Germany at the Euros before their exit in the semis to France. He was meant to be one of our fittest players in the preseason but after featuring against RC Lens, it was reported that he picked up a knee problem in the game (something we didn’t see in the course of the game) and bam, he was out for five plus months after a successful surgery. Wilshere adds depth to the squad and can deputize in two playing positions, the attacking midfield role manned by Mesut Ozil and the box-to-box role currently deployed to Santi Cazorla. According to England, he can feature as a holding midfielder but I’m not convinced by his abilities there. The bottom line is that Wilshere is a player that would have his chance in the team and he hasn’t Debuchyed yet. I just hope the news is false because it wouldn’t make any sense sending Wilshere out on loan. Any thing less than three points at Vicarage Road would have been regarded as a disaster. With a loss and a draw in the bag, Arsene Wenger’s team knew what was expected of them as they came up against Walter Mazzarri’s new look Watford side. With the vast options available to the Arsenal manager, he made some slight changes to the team that shared the spoils with Leicester, as Mohamed Elneny had to give way for Mesut Ozil to return to the team. Wenger had confirmed that Olivier Giroud wasn’t fit enough to start, so he stuck with Alexis Sanchez up front, even though the Chilean had struggled in his first two games in that position. 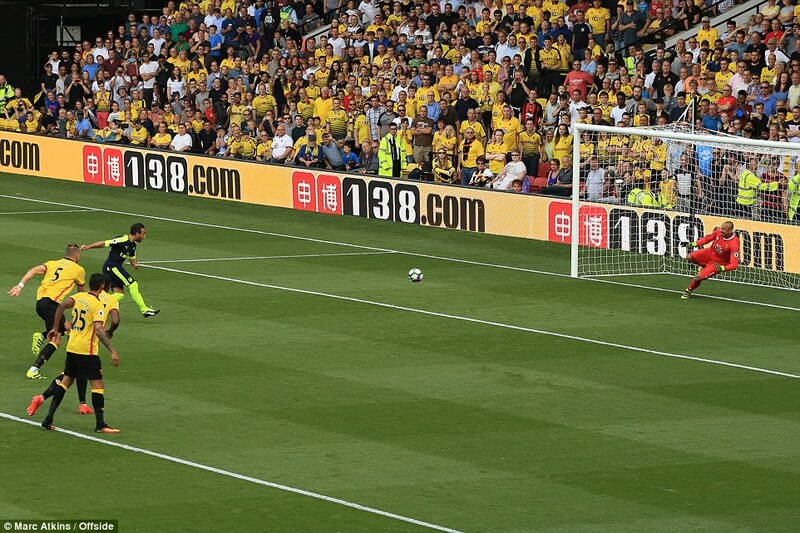 The maverick was quick off the blocks when he won a penalty for his side following a blatant foul from Younes Kaboul. Santi Cazorla banished the ghosts of West Brom last season with a spot kick that went straight to the middle, beating Heurelho Gomes that had dived to a corner. 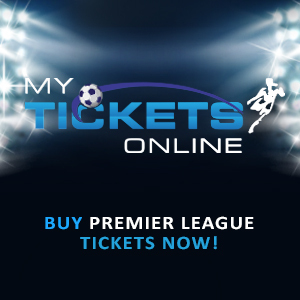 The home side did their bit to get a goal of their own, but Petr Cech was in fine form, and he spared his captain’s blushes when Laurent Koscielny was very close to scoring a calamitous own goal. Arsenal grabbed the second when Sanchez reacted quickly to Theo Walcott’s punt and his chance was cleared but the Goal Decision System came in handy, as replays showed that the ball had actually crossed the line. As scrappy as it was, Arsenal didn’t care. The Gunners were in cruise control at the stroke of halftime when Sanchez’s lofted cross was headed home by Ozil, justifying his manager’s decision to give him the minutes he deserved. At half time, Watford were dead and buried, because it was going to be an uphill task for them to overturn a three-goal deficit against a rampant Arsenal side. Mazzarri made swift half time substitutions including bringing on new signing from Juventus, Roberto Pereyra. 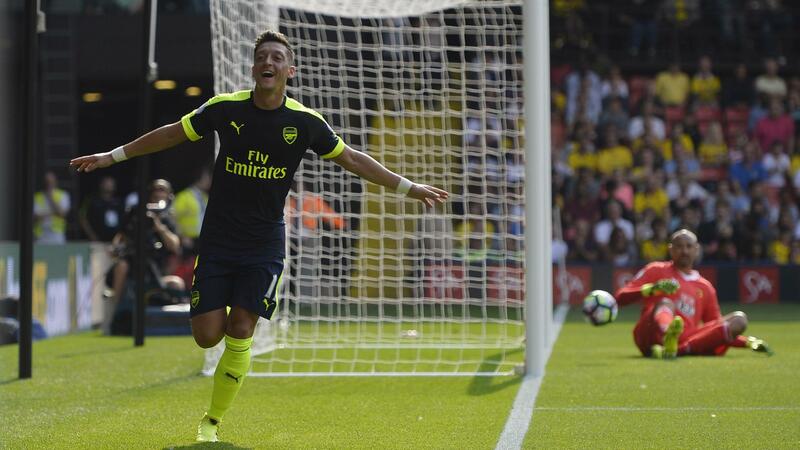 The Argentine marked his debut with a goal that took the wind off Arsenal’s sails. From that moment, Watford piled the pressure but the Gunners did their bit go contain the threat. Wenger threw in Jack Wilshere and Mo’ Elneny to shore things up in midfield, then Nacho Monreal suffered a knock that allowed Kieran Gibbs to get his first appearance of the season. As you’d expect from Gibbo, he did his thing on the pitch. The game ended at 3-1 and the Gunners deservedly got their first maximum points of the season. The manager was pleased with the performances of his lads and confirmed that Monreal just had a normal knock and with no football for a fortnight, and with the Spaniard not expected to be called up for international duty, there would be plenty of time to recuperate. Time to focus on other things this Sunday. Do have a lovely one.